In today's world of technology and modern marketing, it is more important than ever that people can find you online. Google searches account for a majority of local business searches these days, which is why a proper internet marketing strategy is so vital to your success. As local SEO professionals in Liberty Lake, GrowIT Media is dedicated to ensuring that your business is featured correctly online where consumers are searching for goods and services. About 90% of all clicks in Google's search results go to those websites found on the first page. 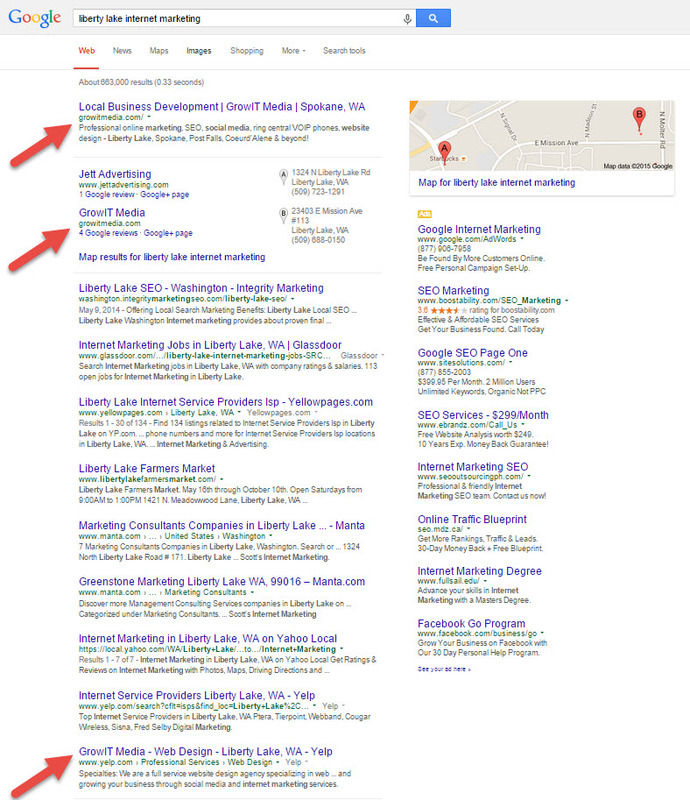 For this reason, it is critical that your company be found on page one for the search terms that are most relevant to your business - for example, "Liberty Lake Dentist." Additionally, your website can be optimized to be found in surrounding cities. Begin by telling us a little bit about your business, your goals, and what cities you would like to be found in. In Eastern Washington, you will likely have customers coming from all directions. Our team will research your field to determine which area a majority of searches are coming from as well as analyze the competition to help you make an informed decision as to which market segment to focus on to get your desired results. Anyone can pay to have their business listed in Google's ads, however, each time a person clicks on your advertisement, you have to pay for it, also known as pay-per-click advertising. This can get quite costly, which is why organic search results are the most cost-efficient. Organic search results are reserved for websites which search engines evaluate as the most relevant and trustworthy for a particular search term. 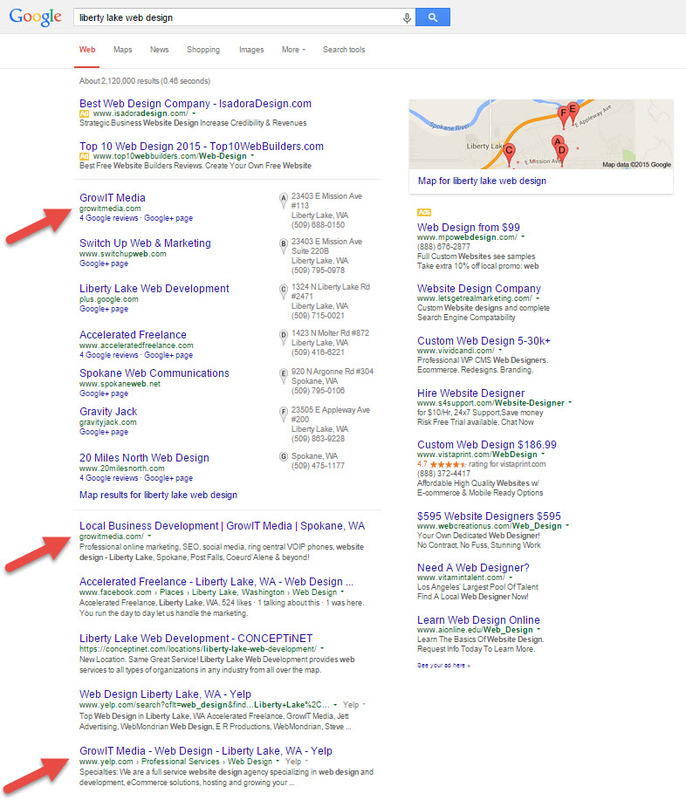 They are typically the most reliable and get the most attention of all first-page listings. In fact, approximately 80% of first page clicks go to the #1 organic position. We can help you get there! With so many mobile devices out there, it is easy for someone to pick up their smartphone or tablet and quickly type in what they are looking for. Websites that are mobile friendly will have a much greater chance to show up in these listings, due to Google updates made in April 2015. With some intelligent, search engine marketing, your site will be found high enough in those search results that a person will be inclined to click on it. After all, most people do not scroll through to the bottom of the page, and very few clicks through to the second page. People trust that the most relevant businesses will be on top, and it's easier to click within those first few results. What About Bing, Yahoo And Other Search Engines? While a majority of local searches are conducted using Google, it is not the only search engine used today. Other search engines such as Bing and Yahoo have a similar algorithm which indexes sites according to relevance and authority. Therefore, all of our efforts spent in ranking your site with Google will have reciprocating effects in other search engines. We ensure this by making sure that your site is properly indexed in each of the less popular search engines. If you are still unsure about internet marketing, take this into consideration: what used to work to promote a business? Phone books worked well at one point. Because people had to use phone books to look up services or businesses in their area. Remember when you needed auto repair in Spokane Valley, WA? You would go to the Spokane phone book and look up Auto Repair, browse through the companies and call one. Today, phone books are just about obsolete. Where do people go to search for the services or products they are looking for? The internet.